Hello there! I seem to have fallen of the blogging bandwagon a bit. I have been trying, I swear! I have a list of potential topics and have been taking photos but the actual blogging part has been eluding me. Anyways, I was thinking I was going to try to refashion an article of clothing or item I have around the house once a month. I have been slowly going through my wardrobe and trying to pin point my style, so I figure this will help to keep my wardrobe slightly full and potentially keep items from trash heaps after I donate my cast offs. So I started in April with a fairly simple one to kick off the hopefully soon to be habit. 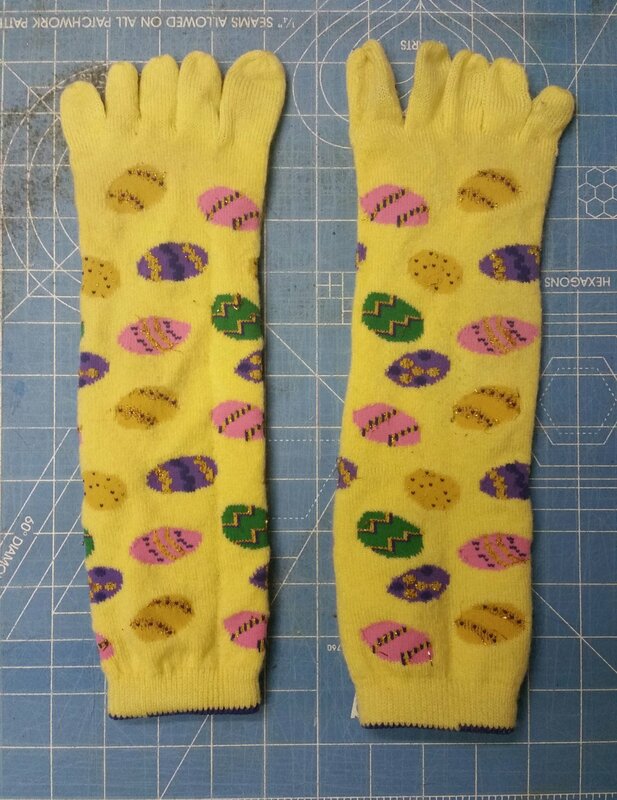 Anyone remember toe socks? How about still have a pair? I accumulated a few pairs of these socks even though I hated wearing them. I don’t really care for regular socks. They definitely are removed with my shoes once I am home. 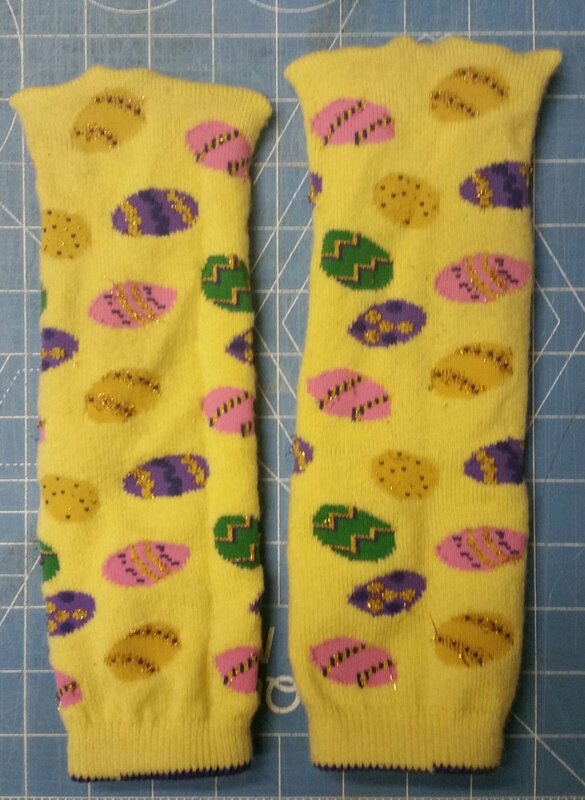 I can’t stand my toes being wrapped in sock material, so why did I still have a pair of Easter toe socks in my sock drawer? Well, they were a gift (all of the toe socks were gifted actually) and I like the design on them. While deciding if they were worthy of keeping, I noticed that these socks didn’t have an actual heel knitted in. So they were perfect candidates to become toe-less regular holiday socks. And the easiest way to do that would be to run them under the overlocker/serger! 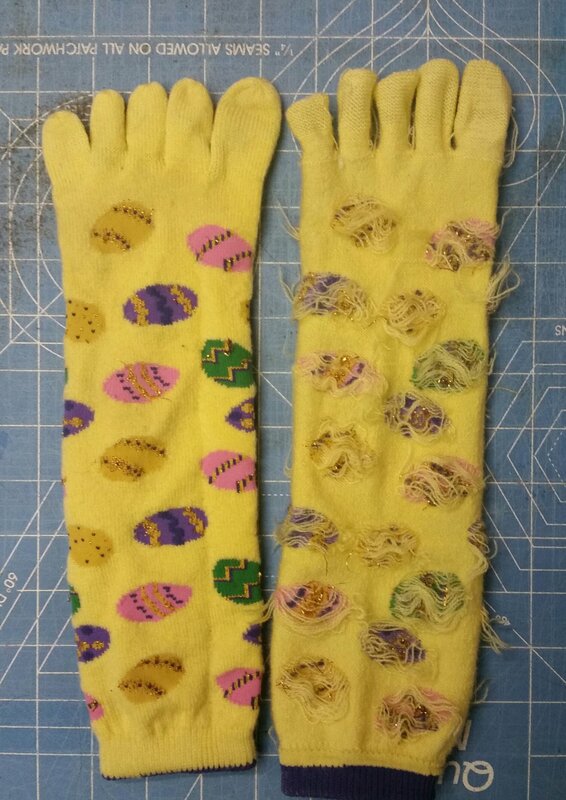 The hardest part to this re-fashion is turning the socks inside out. Once all the toes were arranged properly,I just serged right inside of the toe line so all the toes came off in a chain. Next came finishing the ends. I pulled the serger chain thread back through the stitches using a large needle. Finally, they were turned right side out and on my feet they went! No more annoying toe claustrophobia for these socks! Simple.Easy. Done. Is it fair to even consider this a re-fashion? From two tanks to one! I tried to alter a tank that I purchased from Hot Topic to adjust the fit from a basic rectangle to something that would fit a girl with hips. My plan A was to slash the back and add a gusset so the bottom would have some drape and be flowy. I tried to add in some black mesh but my technique to deal with two stretch fabrics and a point was all wrong. Ugh! Yuck! What a mess! On to Plan B! Lets cut off the back and adda back I do like! I grabbed a tank from my sister’s donation pile that I thought the back would work well for my project. Here they are together. I cut the back of each shirt off at the seams. I then folded the fronts in half down the center. I used the donated top as a pattern for cutting the front of the purple shirt so the shoulders were the correct width to join the new back to. I then sewed the new back to the purple front using my serger. I didn’t worry about finishing where I cut the new neck and shoulder line on the purple shirt. It is not going to fray, so I left it raw. Here is my “new” shirt ready for the gym or even this summers concerts! How do you like my new remake? Pattern Matching and failing at adulting.